A traditional comfort category family Garni hotel is situated in a quite part of the historical center of Prague, Vinohrady (Vinyards). 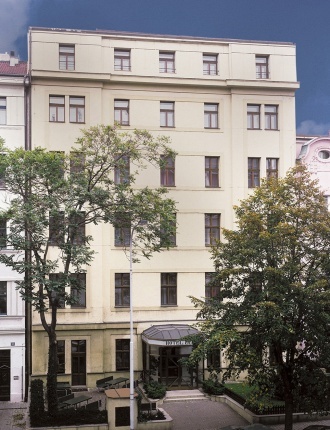 The hotel is 5 minutes walk from Wenceslas Square and 2 minutes from a metro station Namesti I. P. Pavlova, line C. The hotel has 3 single rooms & 32 double/twin rooms (with the option to add an extra bed). The rooms are equipped with en-suite facilities (shower, WC, hair dryer), satellite television, direct call telephone and a safe box. There is a reception desk and the exchange office open 24 hours a day. The hotel provides buffet breakfast from 7 - 10 a.m. The bar is open from 4 p.m. until 2 a.m. Two meeting rooms for 12 and 32 persons available.